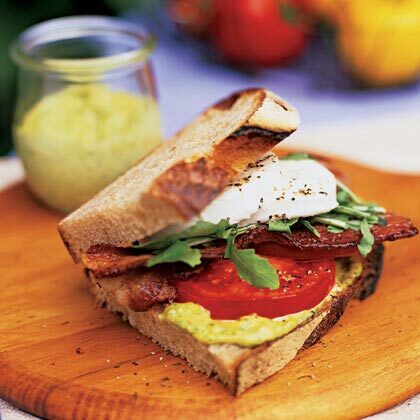 "When the first of the tomatoes come in, I have to have a BLT," chef Bart Hosmer says. "It is the quintessential tomato dish." Spread one side of each piece of bread with basil aioli. Stack one piece with bacon, tomato slices, arugula leaves, and fresh mozzarella slices. Sprinkle with salt and pepper. Top with second slice of aioli-laden bread. Eat with gusto. Tomatoes with wine: Parcel 104's Master Sommelier, Randall Bertao, likes wines with clean, focused flavors and a medium acidity to balance the tomatoes--such as Charles Melton Rosé 2004 (Barossa Valley, Australia; $12) and Merry Edwards Sauvignon Blanc 2005 (Russian River Valley, CA; $27). Note: Nutritional analysis is per sandwich.